TV Solution (2K/4K/8K) | Socionext Inc.
From 2K to 4K, and now 8K. In the world of broadcasting and web content, with constant advances in resolution, sophisticated technology collaboration is essential to fully deliver excellent performance. At Socionext, we provide comprehensive solutions, from the latest video processing technology to hardware and applications. We help our customers deliver new video experiences that make viewers feel as if they are there, along with realistic audio. 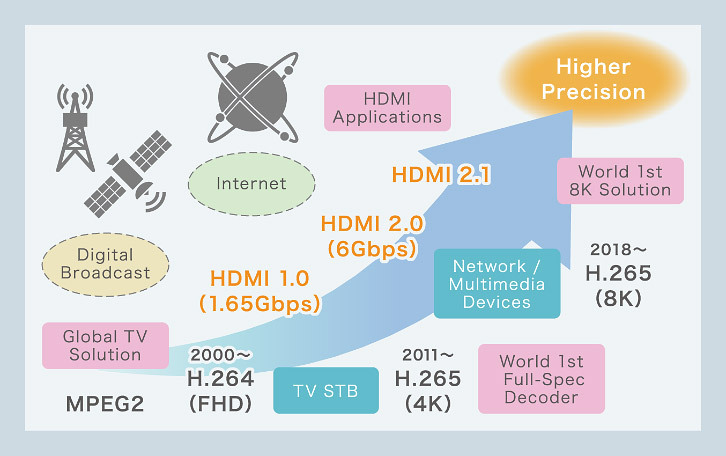 We provided first chipset for 8K TV broadcasting in the world. By taking advantage of video signal processing technologies developed while providing 2K and 4K TV solutions, we are producing video that is optimized for 8K and higher resolution, with high-brightness display panels. In collaboration with broadcasters and TV makers, we will lead the diffusion and development of 8K TV broadcasting services globally. The recent 4K TV revolution has resulted in a transition from conventional broadcasting to content viewing using the Internet, which has come to play a very important role in how people enjoy contents. In addition, online distribution has evolved rapidly. In order to deliver the power of 4K content, we provide comprehensive solutions that are compatible with codec and security methods used in the latest online content distribution standards.